Sophia arrived at Care for Wild Rhino Sanctuary on the 16 th August 2018 at around 11am. Sophia was rescued in the Lower Sabie area of the Kruger National Park after her mother was killed by poachers the night before. Sophia was flown in by helicopter with Kruger Park Veterinarian Dr Peter Buss and the pilot Grant Knight. Despite Sophia’s relatively short time without her mother (less than 24 hours), she was found and attacked by a cackle of hyenas which left her severely injured. Sophia had deep and severe wounds on her face and her back legs, as well as her tail was chewed off, leaving only a very short stump. She was in a lot of pain and was highly stressed from the traumas that she endured. Petronel, together with her staff and local veterinarians, cleaned and dressed Sophia’s wounds as regularly as possible. According to the blood tests that were done, Sophia’s prognosis looks positive. Fortunately, Sophia took to the milk bottle quickly, ensuring she gets all the nutrition she needs to heal and grow strong. Sophia has been steadily settling in and finding comfort in her new home at Care for Wild Rhino Sanctuary. Sophia now enjoys her time outside in the boma, soaking up the sun. When this princess gets hungry, she call for her caretakers to bring her room service in the form of a warm bottle of milk! On the 8 th of October 2018, Sophia was introduced to Kayla-Milan, the other orphaned rhino that arrived on the same day as she did. Their bond was formed instantly and have not left each other’s side since. Kayla-Milan is now Sophia’s comfort and has taken to looking after Sophia with a great heart. She helped Sophia meet the older surrogate rhinos on the 23 rd October 2018 and then met some other younger orphans (Khanya, Rose, Rubybelle and Fern) the following week. Sophia’s wounds continue to heal, both physically and emotionally. We are so happy that Sophia once again has a loving and caring rhino family. 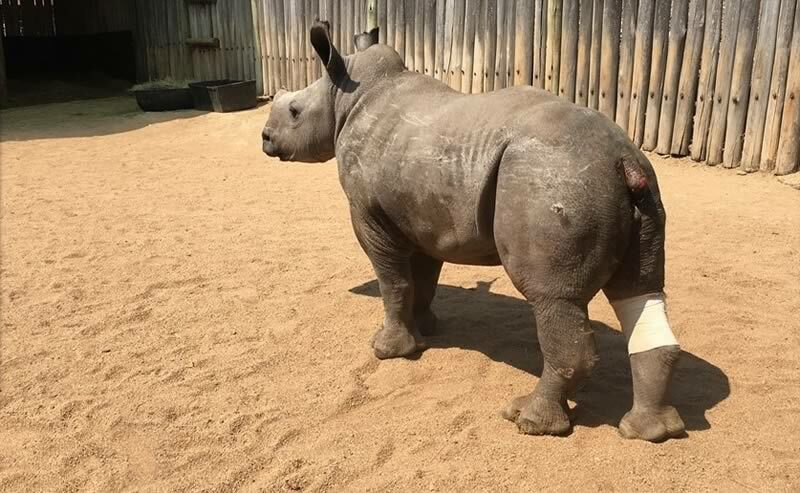 Despite Sophia’s bright future at Care for Wild Rhino Sanctuary, the road to recovery will be a long one. If anyone would like to join Care for Wild in supporting and loving her through her recovery and rehabilitation process, please send us an email to donate@careforwild.co.za to find out how you can help Sophia.